Mind Body Soul Experience is returning to Manchester this April with its unique blend of natural health and spiritual exploration, intended as a retreat from the challenging routine of urban life. 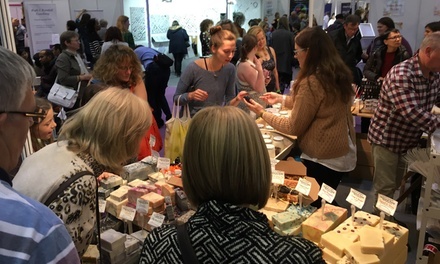 A variety of workshops will once again be accompanied by vibrant entertainment and presentations from dozens of exhibitors, showcasing products such as jewellery or superfoods. The experience will unfold over the course of three days and will feature entry to both the OM Yoga Show and the brand new Vegan Life Live. Visitors under 16 are admitted free of charge to all three events. For two (2): one-day tickets to Mind Body Soul Experience, Event City, 20 or 21 or 22 April, 11 a.m.
For two (2): two-day tickets to Mind Body Soul Experience, Event City, 20 - 21, or 21-22 April, 11 a.m.
For two (2): three-day tickets to Mind Body Soul Experience, Event City, 20 - 22 April, 11 a.m. Restrictions: No booking required. Present printed Groupon on arrival. 14-day cancellation rights do not apply; no refunds or exchanges permitted. Under 16s go free. Valid on option purchased only. Step-free access available. Original values: Verified using our merchant's website on 6 Feb 2018.